Total of 13. Usual distances for everybody. Joseph and Jacob did a 0.5 interval in the middle of their 4 mile run with the target of 3:00 (6:00 pace). Joseph got 2:51, Jacob 2:58. What I was impressed by, though, was that they did it off a rather brisk warm-up pace, and once they were done they maintained a quick pace and broke 30:00 for 4 miles. Joseph hit this in 2:51. I stayed with Jacob. Benjamin did 600-400-200 workout on the track today at Orem High - 1:32.1 (new PR), 59.6 (0.7 slower than PR), and 27.6 (0.6 slower than PR). I did the last 200 of his 600 and was able to keep up. Julia did 2 miles, Joseph and Jacob 3, everybody else their usual distances. Details below. Warm-up with Benjamin + strides and jogging. Benjamin's 600. I ran diagonals to give him splits for the first 400, and then joined him for the last 200. Benjamin's 400. I ran the diagonals to give him the 200 split. Benjamin's 200. I ran the diagonal. Today Joseph and Jacob did their time trials in 400 and 100 and both ran PRs. In the 400 Joseph got 75.8 with the splits of 16 high at 100, 36 low at 200, and 55 at 300. Jacob got 78.8 splitting 17 low at 100, 37 at 200, and 57 at 300. So both probably could improve their 400 with more bear carrying practice and holding back a tiny bit in the first 100. Then I had them do an all out 100. First Joseph did 17.3 - I noticed he was running into some headwind, so I had them do the rest of it going the other way. Jacob hit 16.6 on first try, Joseph got 16.9. Up to that point they were doing those just with me running by the side. Then I had them race each other and they tied in 16.6. I am suspecting Joseph was able to put more effort into the quarter and it wore him out, while Jacob did not quite know how to fight the bear which left him with more energy for the 100. Regardless, I am quite happy with the results, 100 meters in particular. My sense is that Jacob will be in the low 11s as an adult while Joseph will be high 11s or low 12s - but it all depends on how they mature. So far no problems - they have been improving at about the same rate as Benjamin at their age, except they are faster in all distances. Other kids ran their usual distances except Julia who did only 2 because of the cough. Joseph and Jacob's time trials. 400 time trial. I ran with Jacob until about 70 to go, then I sprinted and caught up to Joseph at the very end. Joseph's 100 into a headwind. Jacob and Joseph racing each other in 100. Back to the house with Joseph and Jacob. 16 total. Shorter today due to General Conference. Did 8 mile tempo with Benjamin - he did 12 total. Joseph and Jacob ran 4.7 back to the car with me uphill into a headwind. Julia ran 2 due to the cough. Other kids did their usual distances. Day of rest. Watched General Conference with the family. Took a nap afterwards, then we went for a walk near Bridal Veil Falls. Regular 12. Kids did usual distances, except Joseph and Jacob ran a little shorter - only 3 in preparation for the time trial tomorrow. Today was the day of time trials. Some kids ran well while others have struggled. Stephen was trying to break 9:00 in the mile, was a bit off pace at 800 (4:34) but still on pace for his 9:21 record. Unfortunately he tripped half way through and lost his will to go further, which is common for a 4-year-old. We originally planned for Jacob to run the mile, and Joseph 2000, but today was not their day. We opened with two 90 second quarters, then Jacob could only do 97, and Joseph did not feel good enough to just take off at that point. Jacob's last lap was 93 finishing the mile in 6:12, and I do not know what Joseph was thinking because he maintained the pace and fell back by 4 seconds. Seeing he was going nowhere I stopped him. He was upset with me saying he had a great kick. I gave him a chance to prove himself, and had him run an all out 800. His emotions got him through the first 100 in 17, and 37 at 200, and then he had no juice and could only manage 93 seconds per lap pace finishing in 2:56. Jacob also was not happy with his 6:12 and wanted some closure for the day. So I had him run an all out 800 as well. He opened in 40 at the 200, and the struggled as well finishing also in 2:56. Benjamin had a good 800 time trial running a new PR of 2:05.4. He opened in 29.0 (tailwind), then 31.8 (headwind), 32.0 (tailwind, I ran that one with him), and 32.6 (headwind). I think this is enough 800 speed for now, time to connect the mile and the 5000 to it. He should be running 4:27 and 15:19 respectively. Historically he had a hard time following that curve, though, but we will see how he does. Jenny did a shake-the-cobwebs time trial on the track in 6:38.8 with the splits of 1:40, 1:42, 1:41, and 1:33. Not back to her PR of 6:24 yet, but I think in a couple of weeks she might be there. William was the only running kid who did not do a time trial today - he ran 1 mile at a normal training pace. With Stephen, Joseph, and Jacob. Joseph and Jacob's mile time trial. Warm-up and strides with Benjamin. Jenny ran with us for the warm-up part. Benjamin's time trial - I ran from 400 to 600 and the diagonals to give him splits. With Benjamin from 400 to 600. Benjamin and I paced Jenny in her mile time trial. Back to the house with Benjamin and Jenny. Usual easy run - kids did their usual distances. 800 meter time trials for Joseph and Jacob. Joseph ran 2:46.7, Jacob 2:47.8. New PRs for both by 4 seconds. They opened with 40 at 200, then at 300 I told Joseph to go ahead because Jacob started to struggle. Joseph was 83 at 400, Jacob 84. Then Jacob was able to relax and held the pace better. At 600 Joseph had 2:07, Jacob 2:08. And then both of them had a furious kick in a little under 40 seconds for the last 200. Matthew ran 100 meters in 47.8 - with Jenny dangling a fruit snack in front. Good result for a kid that does not yet talk. Benjamin and I did a workout - Benjamin did a fartlek. The target was 200 in 34 followed by 200 in 30 15 times, he was not as fast on the fast 200s hitting them in around 36, but on the slow ones he was fast running them around 25-26 seconds. I did a tempo 3 miles in 16:35 with the splits of 5:25, 5:36, 5:34. When I caught up to Benjamin he joined me and finished with me. Warm-up with Jenny, Joseph, Jacob, and William on foot, and Stephen and Matthew in the stroller. A jog with Joseph and Jacob. Joseph and Jacob's 800 time trial. When Joseph pulled away I stayed with Jacob and timed Joseph from a distance. Back to the house with the gang. Stephen and Matthew in the stroller. Usual easy run. Joseph, Jacob, and Julia did 4, I pushed the stroller with Matthew and Stephen in it. Other kids ran their usual distances. With Julia, Joseph, and Jacob on foot, and Matthew and Stephen in the stroller. Total of 20. Joseph and Jacob did 5 - their longest run ever- and they volunteered a good pace - 20:05 first half (8:02 average), and 17:40/17:44 second half 7:02/7:03 average on the way back - Joseph pulled ahead a little at the end. Benjamin did 12. He and I did 2x3 in the canyon, first up, second down. On the way up I did 18:25 (5:55,6:19,6:11), Benjamin 17:28 (5:41, 5:55, 5:52). On the way down I got 16:54 (5:35, 5:43, 5:36), he got 15:47 (5:18, 5:12, 5:17). On the way back I joined Julia on foot and Joseph on a bike for a mile. More distance to finish the 20. Day of rest. Went to church. Talked with my mother on Skype. Went for a walk in the evening with the family. Usual run. Benjamin did 9, Jenny 4, Julia, Joseph and Jacob 3 - Joseph and Jacob were resting before the mile time trial tomorrow. William did 2, Stephen 1. I have not been entering Sarah's runs, I should start for consistency. She ran 4 in 35:41 today - one of her faster times. I wonder if there are any kinds of Mother of Nine running records - if anybody knows of any running performances done by a mother of nine children I would like to know. With Benjamin. Caught up to Sarah with a little bit less than 2 miles to go and helped her run 35:41 on her 4 mile course. She did a 7:58 mile in the middle. With Joseph, Jacob, and Julia. Joseph and Jacob ran ahead and finished in around 23:08-23:09 - all over the last 230 meters or so. I am estimating they hit the last quarter which has a 230 meter uphill stretch grade varying from 3 to 6% in around 1:35. I stayed back with Julia and as I saw them pull away as if Julia and I were standing still I just thought Julia was falling apart, but she was running around 7:30 pace. Today was the day of mile time trials. Jacob's was excellent - 5:57.3, new mile PR, first time under 6:00 becoming third child to break 6:00 and first while still 8 years old. Joseph had an OK one tying with Jacob in 5:57.3, also a new PR. Benjamin's was a bummer - he opened in 65.5 and then lost it mentally and just coasted at 5:00 pace finishing in 4:49.2. We will retry Thursday. Joseph and Jacob opened in 86, Joseph was pushing me to go faster. In the second lap I sensed that Jacob was struggling and slowed it down to the slowest possible that would not make sub-6:00 out of reach - second lap was around 92.5. In the third lap both of them were struggling, but I moved forward to encourage a faster pace. The entire time Joseph was screaming No! I think he was worried about Jacob beating him. This got bad enough that I told him he needed to be quiet or he might ruin Jacob's chance for sub-6:00. Third lap was 91. In the last lap I told them to kick. Jacob needed sub-88 to break 6:00. Joseph did some screaming in the last lap, but not as much as in in the third. In spite of the screaming the last lap was superb - 85 seconds, I was not expecting that at all. Joseph was a couple of steps ahead with 100 to go, but Jacob closed all of it in the kick and they finished together with a new PR for both. I asked Joseph later to explain the screaming. He said it just came out and he could not control it. I suppose those things happen at the age of 10 when you feel your younger brother is about to beat you. Other kids ran their usual distances. The epic time trial that resulted in Jacob breaking 6:00 for the first time and earning a guinea pig and Joseph tying with him and running a PR as well. Warm-up with Benjamin + strides. Benjamin's botched mile time trial. I ran the first and the third lap. Splits are at the 400 intervals except the last one which includes the 9.34 meter tax. Easy run today. 13 for me, Benjamin did 9, Joseph, Jacob, and Jenny 4, Julia 3, William 2, Stephen 1. Got some snow. Today Benjamin and Julia did mile time trials. Benjamin did in on the track, Julia in the canyon. Benjamin ran 4:39.4. I ran 600 with him from 409.34 to 1009.34. I cannot take the lead anymore even for those short stretches at his mile pace when he does not crash. It took him 2.1 to get from the start to 4 laps to go, then he ran the next 400 in 64.7, followed by 70.3. So far so good. The demons attacked him over the next lap which he ran in 74.0, but he was able to shake them in the last lap with 68.3. The time was a PR by 1.5 seconds. Not that great, but there was some wind today. What I was happy about was that he won the battle against the demons, and also that while fighting it he could still run a quarter in 74. Julia ran an even paced 6:19.8 down the canyon on our standard course. Benjamin, Joseph, and Jacob helped me pace her. Next step for her is to run this time on the track. Warm-up and strides with Benjamin. Benjamin's time trial. New PR. I ran 600 with him in the middle in 1:46.9. Considered going to the 800, but I felt I was falling off pace, and I wanted to be able to talk when Benjamin had a lap left. Warm-up with Julia, Benjamin, Joseph, and Jacob. Cool-down with Benjamin, Julia, Joseph, and Jacob. Back to the car alone. Usual run. Total of 13. Kids ran their usual distances - Benjamin 9, Jenny, Joseph, and Jacob - 4, Julia - 3, William - 2, Stephen - 1. Stephen's new fruit snack standard is 10:00 mile and he usually gets it. 19.5 total. Benjamin did 12.7 with a workout 3x1 mile down the canyon with 200 recovery jog. I did half miles with longer recovery with him. This was a breakthrough workout for him. I gave him a target of 4:48 for the first one, then just try 4:48s for the rest of it expecting something like 4:53-4:51 for the remaining two - 200 is a very short recovery, the workout is basically like racing 3 miles. He did 4:51, 4:48, 4:44. I knew something was different when I noticed that within 100 meters of jogging after the first interval his breathing sounded recovered. Another good sign is that when he finished the last one he was standing up instead of laying on the ground like he usually does. Something in the area of aerobic support got rewired in his body, which I suppose you should expect around the age of 16. We will see if he can translate that rewiring into a decent 5000 performance next week in the Clarence Robison Invitational. I had a decent workout as well - 2:27.6, 2:25.7, 2:22.3. On the last one after the first quarter in 71 I thought I was going to lose it, but one step at a time I was able to maintain the pace to the finish. Julia, Joseph, and Jacob did a long run today - 5 miles. Other kids ran their usual distances. With Julia, Joseph, and Jacob. Day of rest. Went to church. Was very tired in the afternoon and took a long nap. Went for a walk in the neighborhood in the evening. Usual run - total of 13. Kids ran their usual distances. With Joseph and Jacob. Joseph ran ahead and finished in 29:32. Their first half was 15:38. So 13:54 second half for Joseph, 14:02 for Jacob. I turned 42 today. Jacob, and Joseph did a mile time trial of sorts in the canyon. I told them to just go quick and enjoy the speed with no particular goal in mind, just something faster than what they did on the track. They went through the first half mile in 2:55, then Jacob more or less maintained the pace, but Joseph sped up. Joseph got 5:43.3, Jacob 5:50.4. Julia had the assignment to run the first half mile with the boys but she was not feeling well, so after trying to get her to go some decent pace for 600 meters I told her to just keep running straight to the mile at whatever pace she was running and sped up to catch with Joseph and Jacob. I really had to move because I was already about 10 seconds behind. So I hit 800 in 3:01, and then caught up to Jacob at around 1000 meter mark. I stayed with him until 200 meters to go, and then surged to catch up to Joseph so I could time him. Julia finished in 6:40.1. Then we ran home. Warm-up with Joseph, Jacob, and Julia. With Benjamin after his Computation and Optimization 2 final. Today Jenny and I did 1 mile time trials down the Provo Canyon. Jenny ran 6:10.3, my goal was to break 5:00, and I reached it with Benjamin's help - 4:56.6. That is the first time I went under 5:00 since turning 40 on something that compares to sea level flat (not counting a few crazy splits in the Big Cottonwood half down 8% grade) , and it has been 2 years. So after all maybe my slow down as a master is more training than age related - I am running decent mileage, but my the volume and intensity of my intervals and tempo runs has been way down. Joseph and Jacob did 100 meter time trial racing each other. In the first attempt Joseph did 16.0, Jacob 16.2. In the second, Joseph got 16.2, Jacob 16.3, in the third they tied with 16.4. Jenny's splits were 90,94,93,93. Mine - 73,75,73,75. The first quarter was perfect, Benjamin eased off too much in the second quarter, then overcorrected in the third - amazingly it did not drop me, and then I did not have as much juice in the last one. Joseph is about 1 second faster than Benjamin was at the age of 10, and Jacob is about 2 seconds faster than Benjamin was at the age of 8. Not sure what that means. Benjamin right now will run about 13.0, and probably 12.0-12.5 as an adult. I am not expecting Jacob to run 10.0 as an adult, but possibly 11.0, which coupled with the endurance would make him competitive in the 5,000 and 10,000. Warm up with Benjamin and Jenny. Recovery jog with Benjamin and Jenny. To the track with Joseph, Jacob, and Julia. Joseph and Jacob's first 100 meter attempt. Second 100 meter attempt, Joseph's time. Third attempt - they tied. Extra distance with Joseph and Jacob. Easy run today - total of 12, 2 with the stroller. Benjamin did 6 to taper for the 5000 on Friday. Everybody else ran their usual distances. With Stephen running and Matthew in the stroller. Jenny and William ran the first 0.51 with us, then turned around. Back with Stephen and Matthew in the stroller. Total of 12. Benjamin did only 4 in the morning in anticipation of Clarence Robison Invitational 5000 later in the afternoon, but when we got there the event got rescheduled to tomorrow due to lightening red alert. Perhaps for the better - the forecast is 52 F 6 mph SSW wind with cloud cover and only 20% chance of rain - almost perfect, we would like the wind to be 0 for a track race, but that rarely happens. So Benjamin added 1 mile warm up, and 1 mile extra distance after the announcement in the afternoon. 20 miles total. Kids ran their usual Saturday distances, except for Benjamin who ran a little less, but not much less than his usual 12 due to a track meet. This was his first collegiate track meet. He ran 5000 in the Clarence Robison Invitational at BYU. It was a little unusual to have a 16 year old, especially in Crocs, running against collegiate crew. 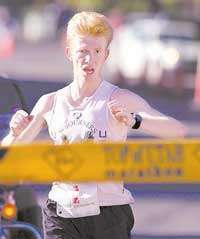 Normally a boy this age would not be allowed to run, but because he is a full-time student at BYU he could run unattached. His time was 15:52.25 and he took 7th place out of 11 finishers. Most of the way he followed two Weber State runners - Braden Perry and Derek Day. He hung on with both of them for 9 laps, then Derek fell off pace and Benjamin stayed back with him, and about a lap later he fell back, but he was able to close a good portion of the gap in the kick. So he ended up 2 seconds behind Derek and 12 seconds behind Braden. His splits are below in the chart. To summarize, he opened with 4:55.9 in the first 1600, then ran 5:06.1, 5:15.3, and kicked in 34.9. One take back I have is that he still needs to work on his confidence. He started to fall apart mentally in the 11th lap. Having more aerobic endurance would have helped as well. He said eventually after 10 laps he just could not have his heart beat fast enough and his lungs pump enough air to support the pace. With Benjamin, William, and Stephen. Alone - to the 4 mile mark in the canyon. Tempo run back to the house. Benjamin's 5000 meter race. Splits by 400s, last split is 200. 12 miles total. Kids ran their usual distances. Benjamin moved up to 10 miles a day. Usual distanced for the kids. Total of 14 for me. Benjamin and I did a workout. He did 2x2, one up one down, I did the first mile of each with him. My first interval (uphill) was 5:35.5, my second was 5:02.5. Benjamin did the uphill 2 in 11:10 (target 11:12), down in 9:55 (target 10:08). I think this was a good workout for both of us. Total of 13. Kids ran their usual distances. William attempted an 800 meter time trial, but stopped shortly after 600. Benjamin and I did a tempo run - 3 miles down the canyon in 16:24.9. Otherwise a usual day. William's botched 800 meter time trial - he made it to 600 meters in 2:37, ran a bit more and then just stopped claiming he could not breath. I am suspecting the problem was that when he gets a lot of air flow it bothers him more than our other children - he appears to have a hyper-sensitive nervous system. So some special training will be needed to reach a higher level in 800 meters - we will work on it. Jogging around the track with William, Joseph and Jacob. 3 mile tempo down the canyon - Benjamin paced me - splits 5:34, 5:26, 5:24. Some headwind.